When we made the decision to donate our 15 year old daughter, Celeste’s organs on October 23rd, 2002, we did not expect to come full circle in our donation/transplant story. Our Celeste had expressed her desire to be an organ donor while on our usual morning ride to Monterey High School here in Lubbock. She saw a billboard promoting organ donation and said, “I would do that!” Those words flooded my brain when we were faced with the heart wrenching fact that our daughter was gone. Juan and I both knew we had to honor her wishes. Just months before Celeste passing, Juan was diagnosed with Hepatitis C. Shortly after he began treatment, he was in full blown cirrhosis and was placed on the waiting list for a liver. The next years were filled with countless five hour drives to Baylor-Dallas, emergency room visits, hospital stays and treatments to eradicate cancerous tumors. Things were looking bleak and Juan became sicker with each passing day. On Good Friday, April 18th, 2014, while at dinner with friends, we got The Call from Baylor-Dallas. His Coordinator’s words were, “We have a liver for your husband. How soon can you be here?” We were airlifted to Dallas and Juan received his life saving transplant on Saturday, April 19th. Since Celeste’s passing, we have been passionate in our support of organ, tissue and eye donation. We make our story known to anyone and everyone who will listen. Celeste’s passing and gift to others has been instrumental in the registration of most, if not all, of our immediate and extended family. In June, 2012, we attended the US Transplant Games as a donor family. We were moved beyond words and attending was one of our most memorable experiences ever. We look forward to attending this year as both a donor and recipient family. Later that August, we were able to meet Celeste’s liver recipient, Laura. The bond between our families has grown with each passing day. Juan was honored to walk Laura down the aisle alongside her dad when she married Geoff in July, 2015. 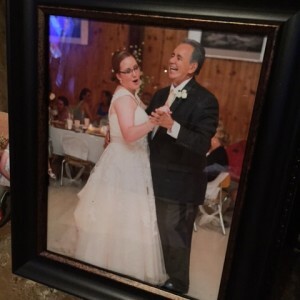 As captured in the photo above, Juan danced a “father/daughter” dance with Laura and we were named “honorary Mother and Father of the Bride.” There was no more beautiful a wedding or more moving a father’s speech than that one made by Steve, Laura’s dad on July 17th, 2015, in which he expressed his family’s gratitude for our decision to donate. Juan has had some hiccups along his road to recovery, but all in all has done wonderfully. He understands his life was extended by another family willing to say “Yes” to organ donation. We often reflect on the fact that as we rejoice on his road to recovery, somewhere another family grieves the loss of their loved one. A feeling, we know all too well. I think we all ponder what our legacy might be when we are gone. Our beautiful Celeste’s legacy was one she chose by uttering those words on what was a normal, everyday trip to school, “I would do that.” Who knew those words would set off a chain of events that would eventually change countless lives and would bring our family “full circle” in our organ donation/transplant journey. This is an amazing family. May God continue to bless them through the rain. Laura & her family are amazing people. I am a OR Nurse, who worked agency @ Children’s & would see Laura come & go for treatment there. I am also from Muenster, so I’ve known them a long time. What a wonderful gift from God, yes, he does answer prayers. Signed up many years ago when Dr Honneycutt’s daughter was killed, going back to A&M one night. They got a call saying on her drivers license, she had signed up to be a donor. So they did just that to honor her wishes. They donated her organs, & did presentations for the signing up to be a donor on your drivers license card. One of the greatest gifts you can give for others you don’t even know. God is loving you Laura, so you can do all that you do, threw your example of life for God.